I don’t typically advocate hitchhiking. So we introduced our method of returning to our car at the trailhead now 50K to the south with a disclaimer. 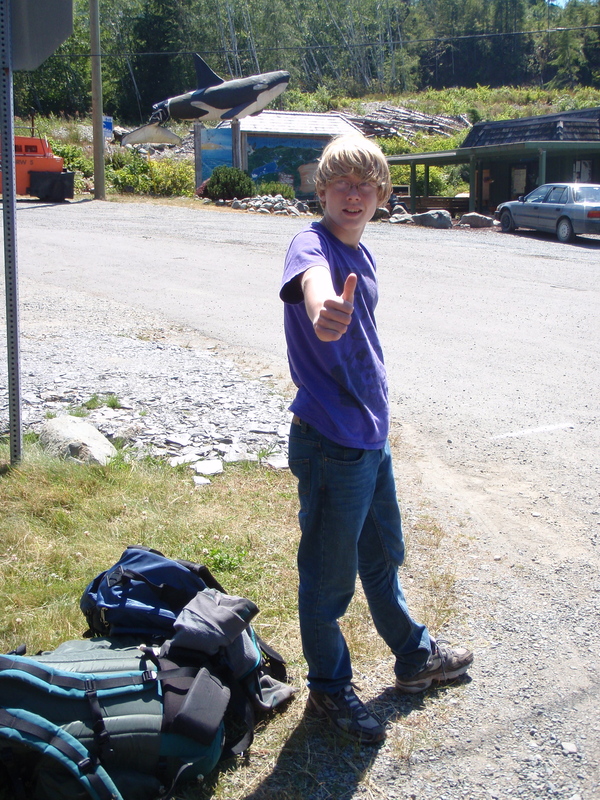 Don’t hitchhike, children. Except when you’ve just been backpacking for days and you’re with your parents. Figuring our family of four would not get picked up together, we split up. Dad & daughter vs. son & mom – let’s see who gets back to the car first. The daughter & dad duo got a ride out of the trail parking lot with some day hikers who had decided to change their starting point and agreed to take them back down the road. Noah and I started walking from the hike parking lot towards the main road, and in a few minutes I heard a rumble behind us. I turned around and stuck out my thumb. The van pulled over, and we clambered in next to the couple’s dog. They were only going as far as the reservation, but could drop us at the intersection of the main road out of town, and were very sociable all the while. That ride left us next to the tourist info office (note the whale behind Noah – though it had seen better days, the whale’s tail was not quite connected to the body anymore). We spent a half hour thumbing passing cars with no luck. I turned to Noah and suggested he smile some and look more adoptable. Then an SUV pulled over and it was a father & son duo we’d seen on the trail. Yahoo! We were grateful they stopped and got to compare notes about our experiences on the trail. After awhile, we looked out to see the other half of our family on the roadside with thumbs out. They looked so darn cute I couldn’t believe someone hadn’t stopped for them. So we piled them into the backseat with Noah & I. We were dropped at the trailhead turnoff, gave sincere thanks to our driver, and walked to our car. Despite all of the dire warnings about break-ins at the trailhead, the car was untouched. We happily headed on to a grocery store where we got what looked good (fresh fruit & veggies, sandwiches, chocolate milk), and debriefed our family hitchhiking.